On Dec 14, 2017, the original CHU released the 1st single from the upcoming album "The Prefix". The single, "I Wish I Knew" features 2 local heavy weights in Arlo Maverick and Josh Sahunta. The song chronicles the challenge these artists are faced with when deciding if they should stay true to their art or conform to the societal trends for commercial success. Goto the Shop Page to purchase the new track for $0.99. I was very honoured to be a part of such an amazing cause with CMHA to raise awareness and hope for people in despair. I offered the use of the song "Crystal Ball" from The Open Book Experience LP for this Lift The Silence Campaign. It's time! People have been asking about if I have plans to do a new album. Short answer? Yes. I have begun the production and writing process for the album and am working on securing some exciting collaborations for the project. The new direction for the album is a logical progression and departure from the style of award winning The Open Book Experience LP. To become a part of the project, check out the video and let's work together. When Dizzy Wright - a highly acclaimed rapper from Las Vegas - issues a challenge to all hip-hop artists around the globe, I can't resist the temptation. When you add the face that some advice that I was once given by Dizzy on Sway In The Morning (a radio call in show), I feel I have to pay homage to Dizzy in the form of a song for his own contest. Win or lose, I want the message to get to Dizzy that I appreciated his comments and advice. The song "Dizzy (thanks)" was born. A video was a requirement of the contest so I decided to do a comedic, kindergarten-esque animation to supplement the video. A huge thanks goes out to the Chu Crew for voting for the People's Choice Award category at the 2017 Edmonton Music Awards. We did it, guys! More sweat, tears and bigger things to come!! New Track Released - "Where I'm Supposed to Be"
Since the release of The Open Book Experience LP, I have been working tirelessly with my production partner Jey Blaq in writing and producing music to help other artists with their musical projects. As rewarding as it has been, I didn't want the Chu Crew to feel neglected so I am releasing a new solo song today called "Where I'm Supposed to Be". It is available with a visual display on YOUTUBE. I hope you like it! Chu and Bad Choice decided to collaborate on a track and the result is a motivational, melodic song called "Tunnel Vision". The song chronicles the laser sharp focus that is required to pursue and achieve your dreams and encourages everyone to do so. The song is available on Bad Choices album "Renegade" and is available now to Stream on SPOTIFY or buy on ITUNES or GOOGLE PLAY. 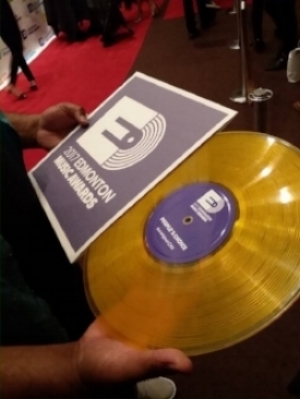 The Edmonton Music Awards released their list of nominees today and I was humbled to find that I was on the list for the People's Choice Award category. It is now up to the music listeners to vote a winner which will be announced at the Awards Gala on June 29, 2017. A huge thanks to the Edmonton Music Awards selection committee and my supporters. Contest winner Stacey A. puts pen to paper as she listens to a ChuBlaqa instrumental. Contest winner meets with ChuBlaqa Productions (the original CHU and Jey Blaq) to brainstorm the concept of the upcoming single release. As a result of attending The Open Book Experience Concert on November 24, 2016 and submitting her name for the entry draw, Stacey A. of Edmonton, Alberta, Canada was randomly selected as the winner of the Musical Experience Draw. Chu and Stacey will get together and Stacey will be given a few instrumentals to choose from. All instrumentals will be original compositions created by ChuBlaqa Productions (the original CHU & Jey Blaq). Using the selected instrumental, they will come up with a concept for a song together. From there, Stacey will be given the opportunity to be present during the writing, recording and mixing of the song. After much anticipation and a successful concert on November 24, 2016, The Open Book Experience LP (TOBE) is now available. The LP has been describes as an explosion of suppressed emotions, fears and anxieties wrapped into a story riddled with pain, despair and eventually triumphs. He chronicles a lost soul chasing his musical dreams until forced to make a decision at a pivotal crossroad in his life. The LP is lyrical, melodic and inspirational. TOBE is available now on Band Camp or anywhere else music is sold. So excited to announce that Roger Wiart of Investors Group has signed on as an official sponsor for the concert! Roger is an amazing consultant (I speak from personal experience) and an even better person. Thanks Roger and thank you Investors Group! Chu Announces Concert to Debut the Open Book Experience. After much anticipation, the original CHU has finally released Crystal Ball for free streaming on his website at www.theoriginalchu.com. Crystal Ball is the 1st single of The Open Book Experience (TOBE) LP which is set for release on Nov 25, 2016. The song and LP confronts head-on some significant topics that many people struggle silently with such as depression, post-traumatic stress disorder, bullying, racism and relationships.